Oral declaration delivered during a General debate of the 38th session of the Human Rights Council in Geneva, on June, 25th 2018. The Islamic Republic of Pakistan’s blasphemy laws present a continuous threat to religious minorities. In particular, section 295-C of the Pakistani Penal Code (PPC) states: “Whoever by words, either spoken or written, or by visible representation or by any imputation, innuendo, or insinuation, directly or indirectly, defiles the sacred name of the Holy Prophet Muhammad (peace be upon him) shall be punished with death, or imprisonment for life, and shall also be liable to fine”. In 1991, the death penalty became the mandatory punishment for blaspheming the Prophet Muhammad’s name. Since the enactment of these laws, over one thousand cases of blasphemy have been registered, over fifty people have been extra-judicially killed by Muslim mobs or individuals, and at least forty people are currently on death row or serving life sentences. Hundreds more have served or are serving prison terms ranging from three to ten years. Yes, most blasphemy charges are false. 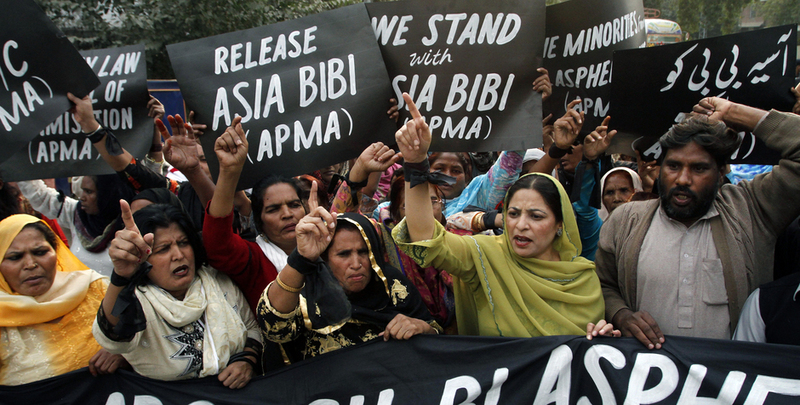 One prominent case is that of Asia Bibi, a Christian mother of five who was convicted of blasphemy for offering her co-workers water from her cup. The coworkers told Asia that she had made the cup ceremonially unclean by drinking from it. They ordered her to convert to Islam, but Asia refused and expressed her faith in Jesus Christ. She was charged with blasphemy, convicted, and sentenced to death. She has been in prison for the last nine years, waiting for the Supreme Court of Pakistan to hear her appeal. In spite of this clear injustice, the Pakistani government has generally remained indifferent to Asia Bibi’s harsh and unjust situation and to others similarly situated within Pakistan’s borders. Pakistan is a State Party to the ICCPR. The Human Rights Council has clearly stated in General Comment No. 34 that “[p]rohibitions of displays of lack of respect for a religion or other belief system, including blasphemy laws, are incompatible with the Covenant”. Yet Pakistan continues to punish people for mostly false charges in violation of the ICCPR. Therefore, we urge this Council to investigate cases of blasphemy, extrajudicial killings, and mob violence and to require Pakistan to repeal or amend its blasphemy laws, to free innocent victims, such as Asia Bibi, and bring perpetrators of violence to justice.